Generally, I think of my bike as an exercise device, albeit an enjoyable one. However, on any given day around the world thousands, probably even millions, of people get on their bicycles and head out the door to work, to do shopping, to visit friends, make deliveries…you get the point. It is a major mode of transportation for many. The first bicycles came into being as people began to explore alternatives to the horse as a mode of transportation. One of the earliest bicycles made had no pedals and was nicknamed a “hobby horse”. In 1865 a version with pedals attached directly to the front wheels came on the market and was known as a velocipede, although it was more commonly called “boneshaker” since it was made entirely of wood and later versions had metal tires. I can only imagine the jarring ride it produced on dirt or cobblestone roads. Around 1870 the first machine to be called a bicycle was made. Most of us have seen pictures of these early contraptions with a very large front wheel in comparison to the rear. They were made of metal with rubber tires and were quite expensive, making them available only as toys for wealthy big boys. Continued tinkering with the design and components saw the bicycle take hold in the 1890’s as a viable means of transportation for the working class and as a leisure activity. Women even took to riding them, which led to changes in clothing design and confining elements such as the corset and bustle became a thing of the past. I’m quite sure that the gentlemen who designed these bicycles did not realize how much of an impact they were having toward the women’s equality movement. 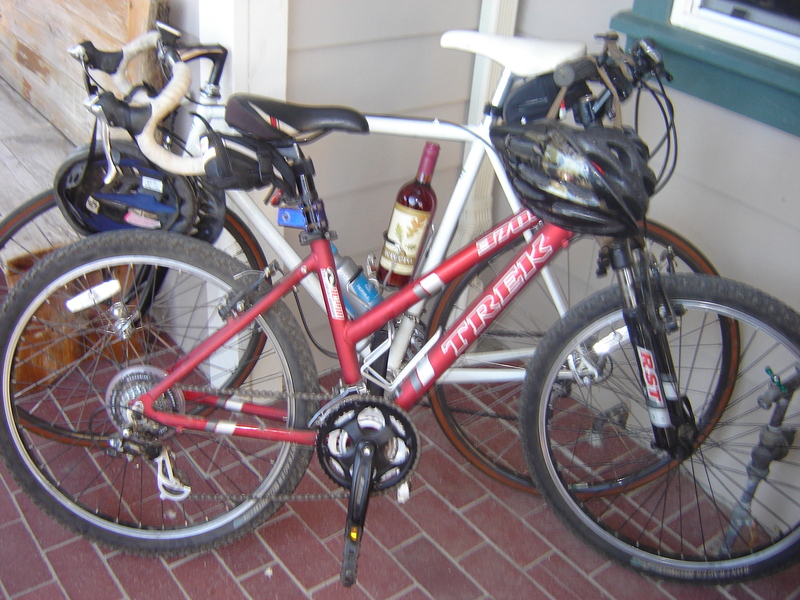 Recently, my husband and I discovered an enjoyable, not much of a workout, use for our bikes when we took off to town for some wine tasting. I live in a town where there are more than 25 wine tasting rooms all within walking distance of each other so not much riding is required but is does add to the fun and is a fairly safe way of getting home post wine tasting. We limit ourselves to two tasting rooms per outing. Any more than this and your tasting starts to get skewed by the amount of wine consumed and since we live so close we know we can always go back another day. Tercero and Pres’quile were our choices for this day. You won’t find these brands in your local wine aisle as they are both low production boutique wineries, but you can buy from then online through their websites. My favorites were at Pres’quile, a pinot noir rose and an estate pinot noir. Yes, I am partial to those pinots. What I love about wine tasting though is that there is generally a lot of camaraderie. We always meet interesting people and have lively conversations with others in the tasting rooms. In fact, if we don’t feel a friendly vibe when we first walk into a tasting room we will turn around and leave. Of course tasting wine often leads to purchasing wine and we discovered that the water bottle cage is the perfect size for holding a bottle of wine! Cheers to those bicycle inventors for bringing us such a versatile and fun mode of transportation! I’m sure we’ll be riding uptown again soon. Joe and I used to have “International Rules” when it came to biking and drinking…you should ask him about it. Sounds like it would fit right in to your wine tasting.